SAIT introduces a tape-based data storage technology platform that in its first generation delivers the industry's highest capacity tape drive, storing up to 500GB of uncompressed data on a single-reel, half-inch tape cartridge and featuring a sustained native transfer rate of up to 30MB per second uncompressed. 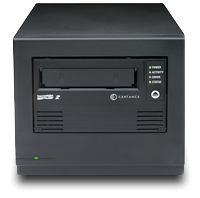 First generation SAIT drives incorporated into automation solutions will provide uncompressed capacities ranging from 10TB in a space-efficient configuration to more than 500TB in a 1,000-cartridge freestanding library. SAIT technology utilizes Advanced Metal Evaporated (AME) media, which combines high capacity with high durability. AME creates a recording layer of nearly 100% magnetic material, in contrast to conventional tape technologies that may have less than 50% magnetic material. Higher areal density and capacity is the result, as well as a smoother tape surface that significantly prolongs head and media life. SAIT leverages Sony's R&D investments, as well as the field-proven AIT recording technology, but scales this into a half-inch cartridge and full-height 5.25-inch mechanism.